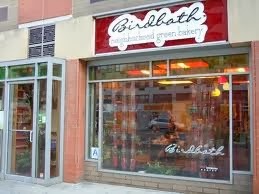 This past weekend, I had the pleasure of coming across a delightful bakery nestled in the heart of the bustling streets of the lower east side. If you are up for a little walk and a quick bite to eat, this is definitely the place to go! The item that stood out the most to me was the warm autumn inspired vegetarian burger topped with pumpkin seeds. It comes complete with cilantro, and avocado to give this dish a balance of lightness to go along with the heavy and rich flavors. The flat beard that surrounds it is the finishing touch on this winner, encasing all these delicate flavors into a melody that dances on your taste buds. Oh so tasty! My favorite pastry is the vegan and gluten free coconut cookie. It has a flaky and crumbly texture that compliments the sweet and nutty flavor. Even a person who isn’t a fan of coconut, much like myself, will be diving for seconds of this delectable cookie.